At Colorado Outfitters, we feel we offer an experience and service that is unique from many other Western Outfitters. While the individual businesses that now comprise us were in existence for years, the current business, Colorado Outfitters LLC was conceived, organized and founded by its owners Mike Dill and Russ Lambert. The vision and goal of our operation is to offer hunting and fishing expeditions across the western areas of Colorado that provide different experiences in support of client's interests and licenses drawn. Just one example of this is that we offer Wilderness Hunts in both the Mount Zirkel and Eagles Nest Wilderness as well as offer 1 on 1 guided hunts within the "elite trophy areas" in the Northwest corner of Colorado (i.e. GMUs 1, 2, 201) for hunters with enough points to draw those tags. The fishing experience is similar in that we also offer different fishing experiences. We have some fun, small river, fast action, dry fly fishing for brookies and also offer some outstanding back country lake fishing! For both hunting and fishing, we continue to pursue new opportunities in support of our goal to be recognized as one of the top Outfitters in Colorado. Another key area we feel differentiates us from other Outfitters is the years of experience and commitment to teamwork that exists within our operation. Our staff is comprised of both guides, packers and wranglers who have many successful years of experience in what they do both within the Outfitting business and on a personal level. Additionally, the large majority of our teams have been friends and have worked successfully together for many years in support of providing our clients the best experience possible while having a lot of fun doing it! This teamwork leads to more successes for our clients and a better overall experience too! In closing, we at Colorado Outfitters are here to serve you and provide you a true western experience that exceeds your expectations in every way. While we can't guarantee every hunter an elk or deer, we can guarantee we will work our tails off to get you an opportunity. In the process, we'll show you some beautiful country, provide you some great meals, and good company too! So, whether your interests are to come hunt, fish or ride some of Colorado's most remote and beautiful Wilderness, we want to earn your vote to be YOUR "Outfitter of Choice"! You have our commitment on that, and we hope to see you in the Colorado High Country soon! Russ grew up in Strong, Maine spending his childhood hunting and fishing the western mountains of Maine. The son of a Maine Master Guide, Russ would harvest his first whitetail buck on a solo hunt at the age of 14. Later he would travel to Colorado as a teenager with his dad and successfully harvest his first bull elk – he was hooked. The Rocky Mountains, the Colorado snow, and riding horseback was so alluring that Russ knew Colorado was where he wanted to be. While a student at the University of Maine, Farmington, Russ worked at Weatherby’s Fishing Resort & Western Mountain Hunter’s Service. Upon graduating from college, Russ immediately made his way back to Colorado and not long after his arrival he was in the woods and on the trail of some of Colorado’s finest big game. Russ’ passion for the outdoors and his love and respect for wildlife is evident as he teaches and shares his knowledge with all who get the privilege of being guided by him. He specializes in big game hunts which include elk, deer, moose, antelope, bear, and mountain lion. Russ is a Maine Master Guide and Certified Professional Hunter of South Africa. Starting at a very young age while growing up in Grand Junction, Colorado, Mike found himself roaming around game trails and mountain lakes in the Colorado Rockies. There was seldom a day when he couldn't be seen riding his bike with a fishing pole or gun on his back, a time when such things didn't alarm people. He learned many valuable lessons and techniques in the outdoors from scouting, his father, his grandfather and many of their friends. He has built many businesses all with the goal of pursuing a career of doing what he loves, a means to an end. That goal eventually became a reality and outfitting is his full time passion. With thirty three years and over 200 harvested elk that he has participated in, his greatest joy comes from sharing his world with as many other aspiring outdoor enthusiasts as he can. He has continued his passion for the outdoors, horses, hiking, camping, fishing and hunting all throughout his life until this very day. Ron is in his element when he’s outdoors. His passion as an outdoors-man grew as he camped, fished and hunted with family and friends. Throughout his teen years he gained additional leadership and outdoor skill sets through high adventure programs offered by Boy Scouts of America, eventually obtaining the highest rank of Eagle Scout. Ron took preparatory courses for guiding online, he left for Livingston, Montana to attend the nationally known ELM Outfitter and Guide Training Program. Ron has been pursuing his passion for guiding for the last 6 years now and is the General Manager of Colorado Outfitters. Bob grew up hunting, fishing and horseback riding in the Catskills of New York State and moved to Colorado twenty four years ago where he's been elk hunting, fly fishing and horseback riding ever since! He thoroughly enjoys taking clients out fly fishing and hunting no matter what their experience level, sharing his years of experience to meet their interests. Bob especially enjoys guiding our back country fishing expeditions and archery elk where he can use his years of calling experience. 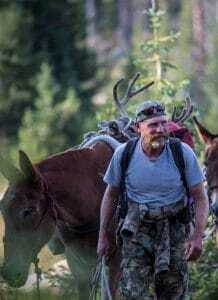 A key highlight in Bob's guiding career (outside of the fishing and hunt trips themselves) was playing a role in Danner Boot's documentary on elk hunting in the Colorado Wilderness entitled "The Trembling Giant" which aired on the Sportsman's Channel in 2014. Bob is entering his 11th year guiding. Maynard got started with hunting and horses in Ohio where he still lives. His first hunt in Colorado back in 2001 left him with a taste for more. In 2007, he decided to come back to Colorado and work for an outfitter where he got started with packing with another Colorado Outfitter employee, Bob Shellum. With Maynard's smooth and calm way around horses and mules it didn't take him long to really catch on to this old time art of mantying and packing loads! Maynard now oversees up most of the packing duties for Colorado Outfitters and also the health of our stock. He takes great pride in his work and you can see it in action when watching how smooth his mule loads ride down the trail! Bob Shellum has worked in the outfitting industry for the past 18 years with jobs ranging from Camp Jack, Wrangle, Head Packer, General Manager, and sales representative. He has also been an Instructor for an outfitter, guides, and packer school along with conducting packing demonstrations and seminars at outdoor sports shows and other venues. In conjunction with the school he also instructed Army Special Forces in packing operations for deployments abroad. He has been mentioned in several articles in outdoor magazines including Western Horseman. Bob also worked as an animal packer for the Department of the Interior at Rocky Mountain National Park in Colorado where he supported the Trails Division, and other entities, for Park Operations. Mark grew up on a small family dairy farm in Ohio where they used horses to do the farming. His dad took him along hunting and riding from a young age which is where he developed his love of both. Mark's first trip out west was in 2011 on mule deer hunt after which he couldn't wait to get back! Since that time, he spent time wrangling in Montana in 2012, hunting the west on his own and then landed his first job working for an outfitter packing and guiding in 2013. Mark joined the team at Colorado Outfitters in 2016 reuniting with many of his former peers he used to work with in another outfitting operation. Mark still lives in Ohio during the off season where he builds log homes but can't wait to get back packing and guiding hunts again each fall. Needless to say, he loves his job at Colorado Outfitters, the operation, the ownership and the people. Ed started out chasing elk as a client of Russ Lambert and Steamboat Lake Outfitters in 2007. After a few years as a client, Russ gave Ed the opportunity to come out as one of his elk hunting guides. Back in Maine where Ed lives he is a Registered Maine Guide. He has worked as a Professional Firefighter/EMT since 2004 and as a Volunteer Firefighter since 1986. Ed also has an associates degree in Land Surveying. Chance is a Colorado native who grew up in a hunting family. He started guiding elk and mule deer hunts in high school. Chance lives for the back country, spending as much time as he can outdoors. He spends the winters watching the animal migrations in preparation for the spring shed antler season. During the summer, his outdoor adventures continue with guiding fishing, riding the back country and keeping a watchful eye on game in anticipation of the fall. Chance also spends a good deal of time training and shoeing horses, actively competing in archery events and keeping abreast of what's new in the archery industry! Although a native Minnesotan, the wide open, wild spaces called Joe out west in the mid 90’s, when he moved to Montana. His love for the mountains, and the game that call it home, kept him in Montana till he moved to Wyoming in 2012. He has a Bachelor’s degree in Wildland Recreation Management with a minor in Wildlife Biology, a Master’s of Science Degree in Technical Communication and a Doctorate of Education. Joe’s role at Colorado Outfitters is primarily on the operations side, specifically in designing and maintaining the website and electronic communications. He has done this work for numerous outdoor-related businesses, including many guides and outfitters. While much of his work is behind a computer, that doesn’t mean you won’t find him at home helping out at camp, on the trail, and in the mountains and water.